Why do people take vitamin K? Low levels of vitamin K can raise the risk of uncontrolled bleeding. 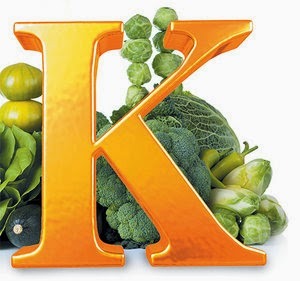 While vitamin K deficiencies are rare in adults, they are very common in newborn infants. A single injection of vitamin K for newborns is standard. Vitamin K is also used to counteract an overdose of the blood thinner Coumadin. In these cases, a health care provider might suggest vitamin K supplements. Uses of vitamin K for cancer, for the symptoms of morning sickness, for the removal of spider veins, and for other conditions are unproven. Vitamin K plays a key role in helping the blood clot, preventing excessive bleeding. Unlike many other vitamins, vitamin K is not typically used as a dietary supplement. The Scandinavian word “koagulation” gives the vitamin K its chemical name, the meaning of this word is exactly the same in the English language. The name of the vitamin is an indicator of its function in this particular case. The presence of the vitamin K is necessary for the formation of the chemical precursors of the compound thrombin, this is the most active agent in the formation of blood clots. The fibrin of blood clots is from by the action of thrombin upon the protein called fibrinogen. As far as coagulation of blood is concerned, the vitamin K is not part of the clot nor is it a component of the precursors of thrombin, the vitamin is important for their synthesis in the liver and its presence in the body in sufficient quantities is therefore important for the clotting of blood. A greatly lowered level of prothrombin and other precursors of thrombin ensue as a result of a deficiency in vitamin K; this is the main reason for an increased tendency to bleed as the coagulation power of the blood decreases. That many other biochemical functions aside from coagulation also depend on the vitamin K has been shown in recent animal research. The fact that the vitamin K is required for proper mineralization of the bones has also been demonstrated in recent animal studies. As a lot of vitamin K is synthesized by intestinal bacteria, it is quite rare for someone to suffer from a deficiency of the vitamin. At the same time as a general rule, incidences of a vitamin K deficiency can be quite common in new born infants; this is because the newborns do not possess any intestinal bacteria that can produce vitamin K. Some of the physical symptoms that can come about if the deficiency is serious including persistent bleeding from the gastrointestinal tract, the production of bloody stools or even blood tinged vomit - these can be evident during the first week or so of the newborn's life. Secondary symptoms include internal bleeding or even bleeding from the umbilicus. A vitamin K deficiency in adults can bring about excessive bleeding from pre-existing wounds and the urine and stool may contain blood. However, though rare, deficiencies of this vitamin can and do develop in some individuals from time to time. A vitamin K deficiency can be brought about by many common factors. The most common cause of the deficiency is long term antibiotic therapy. The long term use of antibiotics results in the destruction of the vitamin producing bacteria in the gut of the person; this removes the primary source of this vitamin in the body and can bring on a state of vitamin K insufficiency in the person. A vitamin K deficiency can also be induced by the long term use of sulfa medications besides the use of antibiotics. Many of the anti-coagulant medications function by interfering with the action of the vitamin K in the human body. At the same time, hemorrhaging due to vitamin K deficiency can also affect many newborns that are born to epileptic mothers already on medications like barbiturates or the drug phenytoin. The rate of vitamin K absorption in the body will be affected or interfered with by any medication or disorder that affects the absorption of fats as the vitamin K is a fat-soluble vitamin and is easily miscible in lipids. The absorption of vitamin K can be affected by disorders like pancreatic problems, conditions like sprue, the nutritional disorder called celiac disease; steatorrhea or it can come after the ingestion of mineral oil as part of some treatment. The vitamin K is rapidly destroyed by excessive exposure to strong oxidative agents, to acids and alkalis and to strong light, though it is not easily destroyed by heat. The supplemental form of this vitamin is available only via the release of a prescription from a doctor; this is so even if there are no reports of toxicity as far as natural vitamin K in the body of adults is concerned. People apply vitamin K to the skin to remove spider veins, bruises, scars, stretch marks, and burns. It is also used topically to treat rosacea, a skin condition that causes redness and pimples on the face. After surgery, vitamin K is used to speed up skin healing and reduce bruising and swelling. Vitamin K is actually a group of compounds. The most important of these compounds appears to be vitamin K1 and vitamin K2. 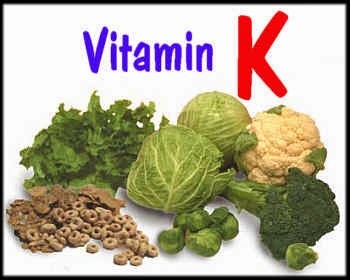 Vitamin K1 is obtained from leafy greens and some other vegetables. Vitamin K2 is a group of compounds largely obtained from meats, cheeses, and eggs, and synthesized by bacteria. Good natural sources of the vitamin K are foods like the green leafy vegetables; these include vegetables like the cabbage and the cauliflower as well as spinach. Equally good sources of the vitamin are organ meats like the liver and soybeans. The main source of the vitamin K in the body is of course, the active synthesis by the friendly bacteria found in the intestinal region. Uncontrollable bleeding is the main symptoms of a severe vitamin K deficiency, this is very rare, and does not affect anyone except individuals already suffering from certain malabsorption diseases. Supplements of vitamin K are often given to all newborn infants to prevent the development of deficiencies that can affect infants who are breast fed. Recently, some people have looked to vitamin K2 to treat osteoporosis and steroid-induced bone loss, but the research is conflicting. At this point there is not enough data to recommend using vitamin K2 for osteoporosis. Side effects of oral vitamin K at recommended doses are rare. The action of some prescription blood thinners can be disrupted by the vitamin K. Therefore, supplements of the vitamin K should never be taken by individuals who use such medications without first consulting a physician or a nutritionist. There are no adverse side effects linked to the compound called phylloquinone - which is the natural vegetable form of the vitamin K.
The effects of vitamin K help the actions of the mineral calcium in the formation of bony tissues and is of course very important in the mechanism associated with the formation of blood clots in the human body. When taken in the recommended amount each day, vitamin K is considered safe for pregnant and breast-feeding women, but don't use higher amounts without the advice of your healthcare professional. Many drugs can interfere with the effects of vitamin K. They include antacids, blood thinners, antibiotics, aspirin, and drugs for cancer, seizures, high cholesterol, and other conditions. Vitamin K is not effective for treating clotting problems caused by severe liver disease. In fact, high doses of vitamin K can make clotting problems worse in these people.